Here’s what your competition doesn’t want you to know about winning product specifications. Your building product is high quality, high value and offers a range of benefits the competition can’t top. But you’ve got a dilemma: To increase product sales in a significant way, you need more architects to specify your product. And you need to displace the competitive specs. 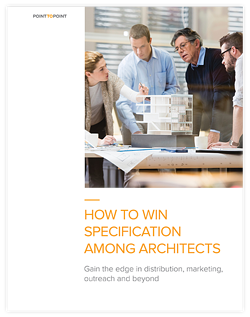 Which is where our valuable insider’s whitepaper, “How to Win Specification Among Architects,” comes in handy. In this free resource, we share years of firsthand expertise serving the building products segment to explain not only how to add new specifications, but also the key elements you must button up to raise your products to the top of spec lists and keep them there. We share hints on differentiating your products, readying distribution, even anticipating the questions your architects will ask. Then, how to build marketing campaigns that speak to their needs every step of the way. Get these and other insider tips by downloading our free whitepaper now. Access your download by submitting the form at right. Then, be prepared to learn the secrets to winning specification. Complete the form to download the guide and start winning the spec.